Hospice Nurses are health care professionals that care for patients at the end of their lives. The term "hospice nurse" is used by many as an umbrella term for a number of different professions. When individuals refer to themselves as hospice nurses, they're most likely employed as one of the following kinds of nurses: Certified Hospice and Palliative Nursing Assistants (CHPNA) or Certified Hospice and Palliative Licensed Nurse (CHPLN). Hospice nurses typically work with terminally ill patients and help ensure their and quality of life during their remaining days, as opposed to working to cure or fix a patient. Their primary responsibility is to help people live as comfortably and independently as possible and with the least amount of pain during their last days. One of the main parts of being a Hospice Nurse involves helping patients, and their families feel more comfortable about death and providing them with the emotional support they need. Additionally, hospice nurses will do their best in assisting family members to manage any practical details that may be involved when caring for a dying loved one. What Are the Educational Requirements for Hospice Nurses? Must have to have at minimum 500 hours of hospice and palliative nursing assistant experience in the most recent 12 months, or 1,000 hours in the past 24 months, all under the supervision of a registered nurse in the United States. Must currently be in possession of an unrestricted active registered nurse license in the US. Where Do Hospice Nurses Work? Hospice care helps patients who are terminally ill to die in a dignified way in their own home instead of in a hospital setting. One of the main jobs of a hospice nurse is to provide emotional support to assist their patients to live as independent and as comfortable as possible near the end of their lives. Often, hospice nurses are expected to stay in communication with family members, physicians, priests, or other spiritual advisers. Hospice nurses should comfortable navigating in crisis situations. 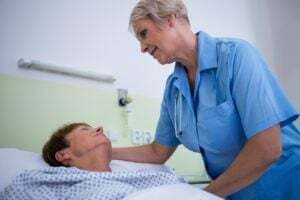 In most cases, hospice nurses are part of a larger interdisciplinary health care team, which administers nursing care to individuals and their families. A hospice nurse's role will depend on the certification they hold (i.e. CHPNA, CHPLN, or CHPN). What Are the Roles and Duties of a Hospice Nurse? Because they're RNs, Certified Hospice and Palliative Nurses (CHPNs) are considered the senior nursing professional on the hospice team. CHPNs are responsible for providing education, supervision, and direction to the other nursing staff. Certified Hospice and Palliative Nursing Assistants (CHPNAs) and Certified Hospice and Palliative Licensed Nurses (CHPLNs), on the other hand, are responsible for providing hands-on nursing care around the clock. CHPNA's and CHPLN's are in charge of day to day nursing activities like managing the patient's pain symptoms, and comfort level. They are also responsible for maintaining the patient's hygiene and making sure they take their prescribed medication at the correct times. Both CHPNA's and CHPLN's must keep an open line of communication with the CHPNs and Advanced Certified Hospice and Palliative Nurse on the case. Advanced Certified Hospice and Palliative Nurse's (ACHPNs) are on the periphery of the hospice team, but maintain a vital role in evaluating the overall condition of the patient and appropriately prescribing the most effective medication. Hospice nurses who are registered nurses with advanced degrees will almost invariably have larger salaries than their nursing counterparts that do not have advanced degrees. According to payscale.com, Certified Hospice and Palliative Nursing Assistants (CHPNAs) and Certified Hospice and Palliative Licensed Nurses (CHPLNs) will on average make an hourly wage between $11.35 to $17.53 per hour or $58,000 annually. The salary of Certified Hospice and Palliative Nurses (CHPNs) ranges between $49,831 at the low end all the way up to $82,023 annually. Lastly, Advanced Certified Hospice and Palliative Nurses(ACHPN) make an average of $96,126 annually.